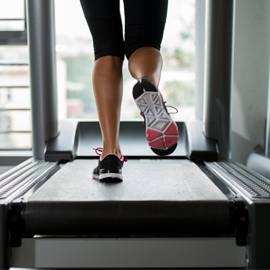 Taking a walk on your treadmill may do more than just enhance your weight loss efforts. According to recent research, exercise can also provide additional benefits such as an immediate improvement in a person’s disposition and mental outlook. Like many forms of exercise, walking on a treadmill produces endorphins. These endorphins are responsible for the commonly referred to phrase known as a “runner’s high.” These chemicals are sent throughout the body while exercising. They are known to produce a feeling of euphoria, which motivates many people to keep on moving. Endorphins are released by neurotransmitters due to a complex process in the brain. They also produce a natural sedative that diminishes the sensation of pain and can also reduce the symptoms of depression. However, the amount of endorphins released during exercise and their effect on a person is based upon the type of workout and varies widely from one person to another. So, while you are engaging in a program for medical weight management with lipotropic injections in Los Angeles, increasing your exercise will not only lead to weight loss but it can also improve your over-all physical and mental health in general.